The new James Bond movie Skyfall has been out in theaters for about a month now, and as pretty much anybody visiting this site must already know, critics are calling it one of the best Bond films in decades. There are, of course, many reasons why the film has been met with the acclaim that it has. The breathtaking action sequences. Javier Bardem’s masterfully villainous performance. The way the film takes a step back and manages to capture the full weight of Judy Dench’s portrait of M, which has, largely unremarked, anchored the Bond series for nearly two decades. But part of the acclaim surely has to do with director Sam Mendes and screenwriters Neal Purvis, Robert Wade, and John Logan’s attempts to allow the influence of modern world into franchise that has always offered the ultimate in wish fulfillment. Is anyone in the world as poised and suave, even for a few minutes’ stretch, as Bond has been at nearly every moment of his fifty-year history? Probably not. And for perhaps as never before (forgetting, for now, certain scenes of the dreadful Die Another Day), Skyfall shows James Bond brought down to human proportions—injured, aging, psychologically compromised, his very vocation placed on the chopping block by members of the British government, his longtime employer in the crosshairs of a killer unlike any he’s ever before faced. Not everyone outside the critics’ inner circles has been enamored with this approach. A number of the detractors I’ve talked to in the past few weeks have taken issue with the humbling of James Bond, their arguments boiling down to: I see what they did there. But that’s not the Bond I grew up with. The unconverted happen to be absolutely right. 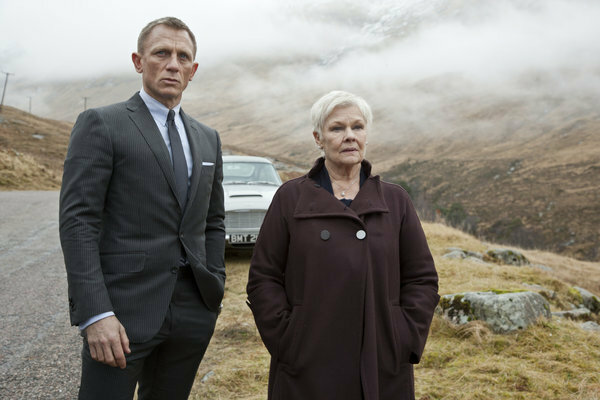 Skyfall’s Bond is a far cry from the Bond of yesteryear. But what really interests me is not whether or not Skyfall is a great film—or a true Bond film–but why the hell it is the way it is at all. To me this newest Bond seemed to display its modern influences like few before it. The frenetically-shot action sequences of the Bourne franchise. An unrelenting sinister villain to rival the Nolans’ interpretation of the Joker. A running length to match the slighter entries in the Lord of the Rings series. It’s almost as if the creators of Skyfall set about to make a film that demonstrates the sum total of what is now considered essential in the blockbuster films of today. Which begs the question: When did it come to pass that every great action movie had to be so concerned with its own relevancy? I first remember taking note of this trend in the most recent Die Hard film, whose most memorable line arguably comes when that particular film’s version of the evil hacker cracks wise to our aging hero: “You’re an analog clock in a digital world!” The Nolan Batman films don’t quite ask the same exact question, but do at times seem to principally exist to repeatedly hit you over the head with WHY! BATMAN! MATTERS! with varying degrees of subtlety. Maybe it’s safe to call today’s action films a new kind of wish fulfillment—of the creators, and a little less for the viewers. Maybe Hollywood just needs, critics be damned, to get back to what it used to do best: presenting us, when the lights start to dim, not with a larger-than-life version of our all-too-life-sized anxieties, but to allow us again to truly escape. To riff off a particularly melancholy moment in The Dark Knight, maybe it’s time to for Hollywood to give us the films we need, not the ones we deserve. Then again, what do I know. I watch some pretty bad movies. Wes Miller is Mulholland Books’ Associate Editor and Marketing Associate. If Mulholland were a crime novel instead of an imprint that publishes them, Wes would be its PI—the stalwart presence resolving its issues, making sure at the end of the day, justice gets served and good prevails—at least until tomorrow comes. Reach him through the Mulholland Books twitter account (@mulhollandbooks), on Tumblr (mulhollandbooks.tumblr.com) or right here on the Mulholland Books website.